Recently, a number of bracelets have caught people’s eyes on Weibo. On these specially made bracelets are the words “Cell Phone Ninja(手机忍者).” The bracelets are part of an experiment carried out by Chongqing Three Gorges University(重庆三峡大学) that hopes students not to use cell phones in class for 21 days. The experiment started on April 12. Each student who wanted to take part in got a bracelet. 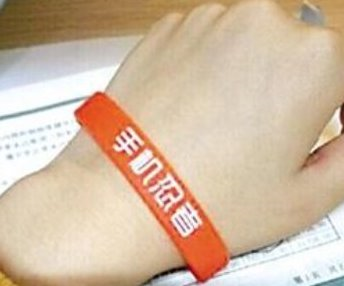 Before the first class and after the last class of each day, students were asked to show a photo of their bracelet to the school’s public WeChat if they did not use their cell phones. Over 800 students signed up for the experiment, and 400 were selected to take part in. After seven days, only 103 students can keep on. The experiment was set for 21 days because of an idea in psychology that 21 days is the right time needed to form any habit. According to the teachers talking about the activity, there were no rewards or punishments in the experiment. The students can decide to take part in or not. Teachers hope students can form better study habits through activities like this one. 1. “Cell Phone Ninja” probably refers to _______. 2. When will the experiment end? 3. Students in the experiment have to show a photo of their bracelets _______. 4. How many students took part in the experiment? A Students will get reward if they finish the experiment. B 21 days is the right time to form a habit in psychology. C The bracelets can stop students from using cell phones. D Students will get punishment if they don’t finish the experiment.